Will the impact ultimately be positive for Polonia? For Poland? In this 2016 presidential election it could be argued that the Polish American Congress (PAC) and Polish Americans have had a critical impact on the final outcome. Basically when the PAC invited the two candidates to meet with their leadership and other Polonians it turned out to be a critical time when Donald Trump was viewed to be indifferent to the plight of many East European and Nordic countries because of his admiration and implied strong support of Vladimir Putin. In addition it appeared that without winning a significant number of key Rust-Belt states such as Michigan, Ohio, Pennsylvania, Illinois, Wisconsin etc. he would not become president. These Rust-Belt states are the home to many Americans of East European and Nordic descent such as Polish, Slovaks, Ukrainians, Lithuanians, Finns, Swedish, Norwegians etc. Many of them are blue-collar, afraid for their financial future and still feel a strong emotional attachment to their ancestral homeland. The largest of these groups are Americans of Polish descent who are very politically actively domestically with high voting turnouts. Internationally Polish Americans and other ethnic groups would have focused on the threat posed by Russia to Poland and other East European and Nordic nations. So when Donald Trump expressed admiration and respect for Vladimir Putin this left many of them uncertain about Trump’s international direction although they felt that he was more sensitive to their domestic problems. While the converse was most likely true for Hillary Clinton. So what could Trump do in a tightening race? Well the Polish American Congress provided an opportunity which he took full advantage of while Hillary Clinton did not. The Polish American Congress invited both candidates to Chicago to explain their positions to a small group of Polish Americans who were active within Polonia with many of them holding leadership positions in various Polish-American groups. Both candidates responded positively. Donald Trump chose to appear in person and Hillary Clinton sent the very exceptional and brilliant former Secretary of State, the Czech born Madeline Albright who is also a Polish speaker. With Secretary Clinton’s apparent lock on a sufficient number of Midwest Rust Belt states and Trump being in potentially hot water with Polonians, Poles and others because of his attitude toward Putin it may not have seemed necessary for her to personally appear. After all the Polish Americans who were one the old line East European ethnic groups had been coming to the United States since the 1880’s and a large percentage of them generally tended to vote Democrat and besides was it really necessary to appeal directly to these old ethnic groups? Also with many of Polish and other East European and Nordic groups having an undying dislike and out right hatred of Moscow which over time had murdered and destroyed the lives of so many of their immediate families and their ancestors plus Trumps blundering admiration for Putin, to Hillary it must have been seen as a no-brainer that this did not require her personal attendance. Additionally she had one more ace up her sleeve and that was the work that President Obama had done to save the auto industry. However there was a big negative which may have been overlooked, and that was her apparent support for international trade deals which had moved American jobs overseas. By contrast Trump had always said if he became president he would tear up such trade deals in order to bring jobs back to America. Trump reverted to old style ethnic political schmoozing and used the meeting to “personally” present a position of great love and admiration for Polonians and Poland. In addition to his being there, the media was in attendance with many waiting to see, and record how he was going pull his chestnut out of the fire or get toasted. Well he did pull the chestnut out of the fire with a fine old-style ethnic focused political approach. Some of Trumps comments, which were all in English, appeared on the American and international television and in the print media. Also his comments were repeated frequently over Polish-American media and no doubt other ethnic-American media. The other ethnic groups perhaps felt if Trump responded so positively to Polish Americans he would do so for them. Republican presidential nominee Donald Trump has spoken about his intentions to work with Poland if elected to the White House. Trump was speaking on Wednesday, September 28, 2016 at the Polish American Congress in Chicago. “I’ve had so many friends [from Poland] who have been so loyal to me,” Trump said. “The Polish people are great people,” he told members of the Polish minority in the city. “If I get elected, believe me, we will take care of all of our people. You have a very special place. Polish-Americans, what you’ve done for this country, is really incredible. “Poland has been a great friend to America. During the Cold War, Poland kept the flame of freedom under Communist oppression,” Trump said. Trump congratulated Poland for being one of just five NATO member countries to spend two percent of GDP on defense. “We will work with Poland on strengthening NATO when I am president,” Trump said. Who knows what President Elect Donald Trump will do for Polish American blue-collar workers and for Poland when he takes office in January. But his willingness to meet personally with members of the Polish American Congress and other Polonians and then to tell them what they wanted to hear was vintage old style ethnic politicking which still works. Especially for the older ethnic groups like Polish Americans who have been forgotten by the “intellectual elites” of both major political parties and the media! It will be interesting to see if this is the beginning of a trend to “focus on the older ethnic groups” by presidential contenders in 2020. Take the time to re-read Trump’s comments. Perhaps it is pure schmaltz but doesn’t it make you feel good to read and hear such words especially given all of the anti-Polish bigotry which exists? When Polonians and Poles hear it many may think to themselves: “here is someone who understands who we are, what we have done and what we expect”. The above comments made by Donald Trump at a critical time in the election may have played an important role in his victory. They certainly would have encouraged Polish Americans and other East European and Nordic ethnics to look past his admiring comments of Putin and give him the benefit of the doubt in what would be a very close election in a number of Rust Belt States. Hopefully President Elect Trump will realizes that he needs to back up his words with concrete actions. Ethnics have long memories of both the good and the not-so-good which they experience. 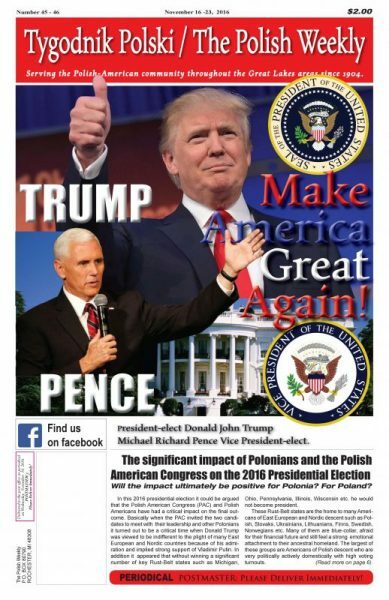 When Trump won, Frank Spula the president of the Polish American Congress sent a congratulatory letter inviting President Elect Donald Trump to attend a 2017 meeting of the Polish American Congress in Washington DC. So will the impact of President Elect Trump’s words be positive for Polonia, for Poland? I will leave that for you to decide. For sure twelve months from now we will know a lot more!